"He told me we were going on vacation. I didn't know we was gunna be doing Rambo s&*t." Ugh, this looks so bad. Gravitas Ventures has debuted the official trailer for a crime comedy titled All About the Money, featuring an eclectic cast of actors. The wacky plot involves two "down on their luck" friends who are convinced by another friend to go on a vacation. Only after landing in Colombia do they realize that they are there to attempt to capture America's most wanted criminal - with no military training. The film stars Eddie Griffin, Blake Freeman, Casper Van Dien, Jon Gries, Mindy Robinson, Lin Shaye, as well as Danny Trejo. This looks like another movie right out of the 90s - totally ridiculous plot, ridiculous characters, lots of guns, absurd action. What more could you ask for? Oh right, some genuine humor maybe. Two "down on their luck" buddies are convinced by a third to take a vacation to Columbia. Only after landing in the third world country do they realize that they are there to attempt to capture the United States' most wanted criminal. With no military training, the friends ensue on an insane and action-packed adventure as they try to track down the criminal to claim the $25 million bounty on his head. 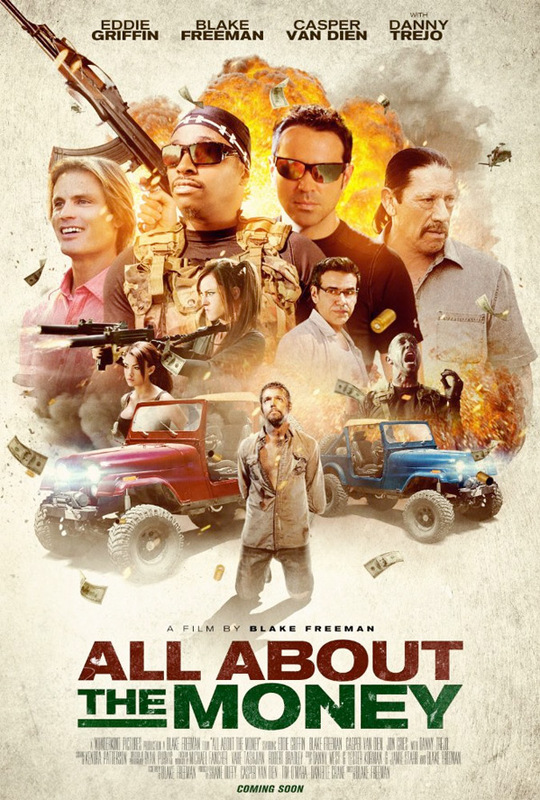 All About the Money is directed by filmmaker Blake Freeman, of the film Noobz and the doc A Journey to Planet Sanity previously. The screenplay is written by Blake Freeman; based on a story by Danny West, Lester Korman & Jamie Starr, and Blake Freeman. This was made under the working title Mucho Dinero. Gravitas Ventures will release All About the Money in select theaters starting June 2nd this summer. Anyone want to see it?